With the Iberian discoveries in the Renaissance we can observe a reinforcement of the relations between Germany and the Iberian Peninsula that goes back until the time of the crusades in the Late Middle Ages (Pohle, 2000). A closer economic relationship (Pohle, 2017) was especially promoted after the marriage of the Holy Roman Emperor Frederico III with the Portuguese Princess, Infanta Leonor (1436-1467) which took place in Rome in 1452 and had initiated - along with the contemporary Iberian discoveries in Africa (Lopes, 1992) and the »Novos Mundos« (Kraus, 2007; Lopes, 2016) - more intensive contacts between both nations. In the late fifteenth century settled on the Iberian Peninsula and in Lisbon not only German book printers, soldiers (bombardeiros, Metzig 2010), Renaissance craftsmen and humanistic scholars, but also agents of the famous trading houses from the upper German imperial cities of Augsburg and Nuremberg. Especially worth mentioning are here, besides the Welser, in particularly the Fugger family, that established important trading factories over all Europe as one can see on a portrait of Jacob Fugger (»the Rich«, 1459-1525) together with his accountant Matthäus Schwartz. We used exactly this image as background illustration (fig. 1) for a poster for the International Workshop »Renaissance Craftsmen and Humanistic Scholars: European Circulation of Knowledge between Portugal and Germany« in the Portuguese National Library (20st/21th November 2014, see Horst; Lopes; Leitão 2017). It represents two noblemen standing before a bureau, where the correspondence with the various factories was archieved. Therein, the Fugger factory in Lisbon is emphasized in written form - alongside with further merchant settlements of the family in Rome, Venice, Ofen, Cracow, Milan, Nuremberg and Antwerp. This image visualizes not only the close economic connections to Portugal, but documents also the transnational exchange in Europe wherein the Germans played a major transmission role for the circulation of knowledge on the Iberian Peninsula in general (Horst, 2017, 17-18). of Knowledge between Portugal and Germany« in the Portuguese National Library (20st/21th November 2014). With the European exploration and Portugal's Age of Discovery emerged throughout Europe princely cabinets of curiosities (»Kunst- und Wunderkammern« cf. Hoppe, 1994; Impey/MacGregor, 1985; Siegel, 2006; Valter 2000), as »theatrum sapientiae«. These early-modern cabinets of wonder contained especially ethnographic exotica from overseas (Bujok, 2009) exchanged by cultural intermediaries like artistic agents/dealers from the Iberian Peninsula (Jordan Gschwend/Pérez de Tudela, 2003; Jordan Gschwend, 2017). There often can be found also other artefacts: namely unique works of art (e.g. two rediscovered views of the Rua Nova dos Mercadores in Lisbon by Jordan Gschwend/Lowe, 2015), antiquities, books, instruments (e.g. globe pairs and armillary spheres), maps, besides objects of natural history, religious and historical relics. The cartographical exchange of knowledge also can be demonstrated with German maps and books that found their way already in the sixteenth century to the Iberian Peninsula. For instance, this is documented with a unique manuscript in the archive of the Fuggers in Dillingen that even tells us even the prize of the valuable cartographic objects that in 1546 were send in wine barrels to the Spanish cartographer Alonso de Santa Cruz (1505-1567) in Madrid (Meurer, 1997). On the other hand, original Iberian portolan charts were exported also to the German-speaking world: Some of these cartographic cimelia (as the map »Kunstmann I«)1 probably got into possession of the Fugger family through the agency of the Augsburg Humanist Konrad Peutinger (1465-1547), who served as a counselor for Emperor Maximilian I (1459-1519), the son of the Portuguese princess Leonor (Eleanor of Portugal, 1436-1467). The court library of the Bavarian Dukes was originally located above the vaulted chamber of the old court in Munich residence, founded in 1558 with 800 books from the Austrian orientalist Johann Albrecht Widmannstetter (1506-1557), and the extensive collection of the Augsburg patrician Johann Jakob Fugger (1516-1575) - with more than 10.000 volumes that were acquired for Duke Albert V of Bavaria (r. 1550-1579) in 1571. The growing library was located near the so-called »Antiquarium« in the new building of the residence, founded in 1568 (Diemer, 1995; Seelig, 2008). A few years later, Wolfgang Prommer, made an inventory of the map collection containing 40 maps in 1577 (Hartig, 1917: 352-356). 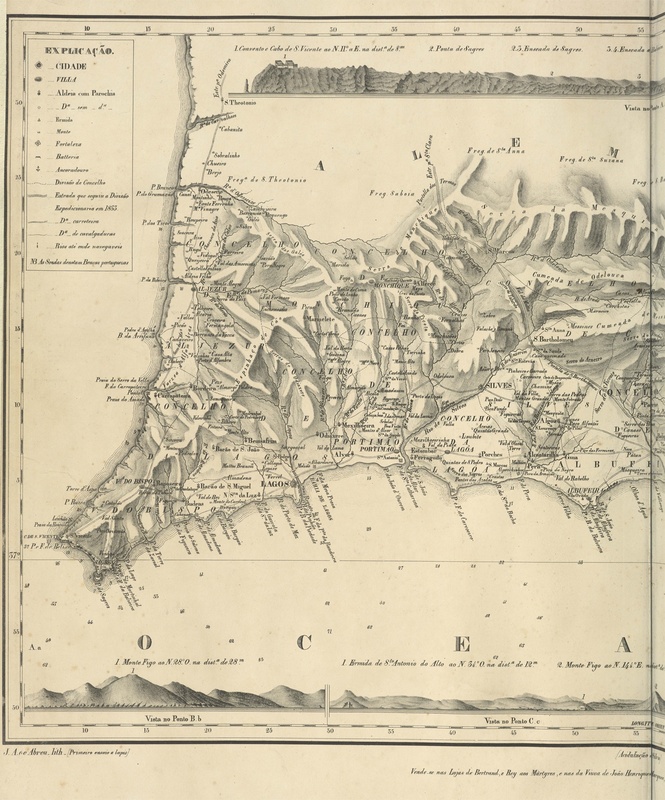 Much later, in the library catalogues of the nineteenth-century, we find in Munich not only a Portuguese atlas made by Fernão Vaz Dourado in Goa in 1580 (fig. 2)2 there, but also the »Plantas das Cidades e fortalezas da conquista da India oriental« (fig. 3)3 that were probably drawn around 1648 by one of the most prolific Portuguese cartographers, João Teixeira Albernaz the Elder († 1662). Together with these atlases, two Iberian portolan maps (»Kunstmann I & II«) were integrated in the later-called Bavarian State Library. These nautical charts were for the first time analysed by the Bavarian philologist and librarian Johann Andreas Schmeller (1785-1852), who gave a paper about the oldest manuscript sea-charts at the Bavarian Academy of Sciences in December 1843 (Schmeller, 1844). 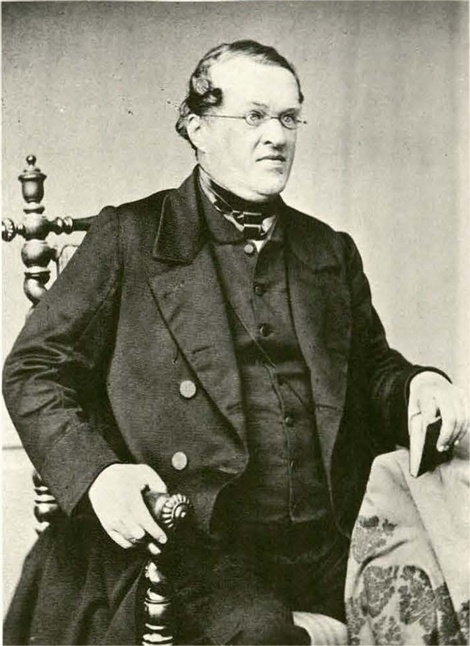 At the same time, lived in Lisbon one of the most important but mostly forgotten protagonists, the Bavarian theologian Friedrich Kunstmann (1811-1867, fig. 4), in total for four summers, from 1841 to 1845: The invitation by the Portuguese Queen Mary II of Portugal (1819-1853), who was for the second time married with a German, Ferdinand II of Sachsen-Coburg and Gotha (1816-1885), changed the life of this catholic priest completely: Kunstmann became educator of the nine-year old Brazilian Princess Maria Amélia (1831-1853, see Almeida, 1973), the only child of the Brazilian King Dom Pedro I (1798-1834) and his second wife, Amélie of Leuchtenberg (1812-1873, Empress of Brazil from 1829 to 1831, see Schmidt, 1927 & Torres, 1947). During his time in Portugal, Kunstmann (who later became professor of canon law in Munich) was able to do intensive research in Portuguese archives and libraries. This is impressively documented with his report that he gave at the Bavarian Academy of Sciences on 13th of January 1844 (Kunstmann, 1844): Therein he mentions for instance not only the opening hours of the Royal Public Library of the Court in Lisbon4, but also the public library in Porto that was founded in 1833. While speaking about the Libraries of »Necessidades« and »Ajuda«, Kunstmann also informs us about his meeting with the Portuguese novelist and historian Herculano Carvalho (Alexandre Herculano de Carvalho e Araújo, 1810-1877, see Döllinger, 1878 and Machado Santos, 1965), who granted him access to the unique royal collections that were normally not open to the public. Kunstmann also tells us that Herculano - who still corresponded with him as well as the Bavarian church-historian Ignaz von Döllinger (1799-1890) many years later (see Huppertz, 2001: 1-3) - provided him the books for his research even in his own apartment as Ajuda Palace was too cold for study during the wintertime (Kunstmann, 1844: 89-90). Besides Herculano, Kunstmann came into close contact with further Portuguese intellectuals, with whom he corresponded also years after his return to Munich. We find among them for instance the politician Joaquim Heliodoró da Cunha Rivara (1809-1879, see Farinha/Franco, 2009) or the Marques of Resende, Antônio Teles da Silva Caminha e Meneses (1790-1875). He also was in contact with the German geographer Baron Wilhelm Ludwig von Eschwege (1777-1855, see Sommer, 1952), the well-known architect of the Palácio Real de Pena in Sintra, and director of mines in Portugal, where he arrived in 1803, accompanied by another military engineer Friedrich Ludwig Wilhelm Varnhagen (1783-1842), the father of the renowned historian Francisco Adolfo de Varnhagen (1816-1878; since 1872 Baron and 1874 Visconde de Porto Seguro, see Moreira Lima, 2016), who became one of the closest friends of Kunstmann. 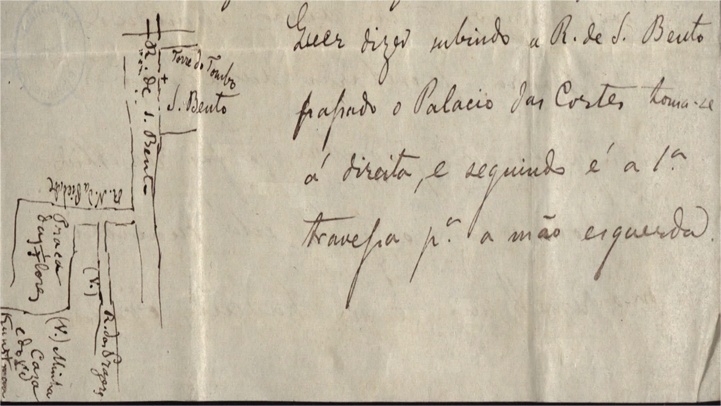 This is also documented in a letter which Francisco Adolfo has sent to him on 5th of August 1844.5 Therein he invites him (»meu amigo Kunstmann«) to visit his house in Lisbon (»Rua dos Prazeres no. 71«), that could be easily found by his friend, as the letter contains a sketch of a map (fig. 5), which shows the best way to his house from the Torre de Tombo: »Não sabes onde é a Rua das Prazeres. Eu te faço um mappa«! the Torre de Tombo in Lisbon, 1844 (University Library of Munich, Nachlass Friedrich Kunstmann A 2, Korr. Varnhagen 3). The Rua dos Prazeres still exists, even if the numbers of the houses seems to have changed in the meantime. At the University Library of Munich all personal remains of Friedrich Kunstmann are preserved until today. He became a member of the Portuguese Academy of Sciences in Lisbon and was honoured also as knight of the Portuguese order of »Nossa Senhora da Conceição de Vila Viçosa«. The material in his inheritance has never been analysed before. That is why the author of this paper is planning to edit a complete edition of the correspondence; around 100 letters, which have been sent to him. Of special importance is further his atlas about the history of the discoveries of America that Kunstmann published in 1859 at the occasion of the centenary of the founding of the Bavarian Academy of Sciences. The second volume of this atlas (Kunstmann; von Spruner; Thomas, 1859) contains 13 facsimiles of manuscript maps, beneath them the portolans known as »Kunstmann I« (made by Pedro Reinel in 1504/19? ), »Kunstmann II« (drawn between 1502 and 1506) and six sheets of the atlas by Vaz Dourado in Goa (1580). 5. Lost Portolan Maps at the Library of the Bavarian Army? The »Königlich Bayerische Armee-Bibliothek« was founded at the beginning of the nineteenth century (Horst, 2018 a). Until WWII it had an inventory of ca. 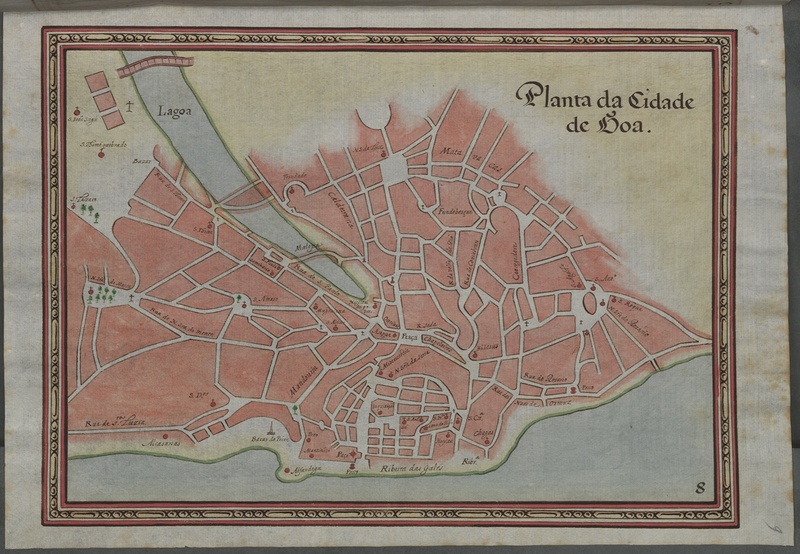 214.000 books, 1.165 manuscripts, more than 400.000 printed maps (thereunder also 153 maps of the Iberian Peninsula as listed in old catalogues) and around 500 manuscript maps. In the secondary literature can be read, that most of the collection was destroyed while the bombing of Munich at the end of the Second World War (Horst, 2018 b). But after intensive research about the unwritten odyssey of this important international collection I can claim the contrary: In fact, most of the unique cartographic prints and manuscripts were stored in different places mostly outside of Munich, and so fortunately survived the destruction of the building (Horst, 2019). Today the collection of the former Bavarian Army Library is split in various German institutions: one smaller part was integrated into the Bavarian State Library already in the 1960s with the help of its director Gustav Hofmann (1900-1982), but only has been catalogued recently. More than 1.000 manuscripts of the Bavarian Army Library were stored in Berchtesgaden and survived the war, but they met their fate already in December 1945, when American soldiers burnt them, without knowing the value of these documents (Horst, 2018b: 266). But this concerns only written documents, not the manuscript maps itself what had been stored at another place, at a castle near Landshut. That is why we still could rediscover more than 500 manuscript maps of this special collection in Munich (Horst, 2019). However, parts of the former Bavarian Army Library might have never been restored to Germany and still remained somewhere in the United States or in private hands, insofar as we know that even the destroyed building in Munich was robbed several times in 1946. The typical stamps on these maps will be of big help for their identification (Horst, 2018 a: 106-107). We are planning to do further research on this interesting topic in the near future. 1. This portolan, today preserved in the Bavarian State Library Cod.icon.132, was drawn by the Portuguese cartographer Pedro Reinel at the beginning of the sixteenth century, see Kupčík, 2000: 21-27. 2. This map (today: Bavarian State Library, Cod.icon.137) entered the library only after the secularisation in the 19th century. It probably belonged formerly to the convent of Augustine canons in Polling. 3. Today: Bavarian State Library, Cod.icon.162. 4. This library was set up in 1796. According to Kunstmann the opening hours were from Monday to Saturday from 9 am to 1 pm and only two hours in the afternoon. 5. University Library of Munich, Nachlass Friedrich Kunstmann A 2, Korr. Varnhagen 3 (Letter written in Lisbon, 5th August 1844). 6. Only eight years later, the original atlas was parted in single sheets and rebound after the theft of the frontispiece and one of the manuscript maps (number eight in the original order), see Garcia et al, 2014. 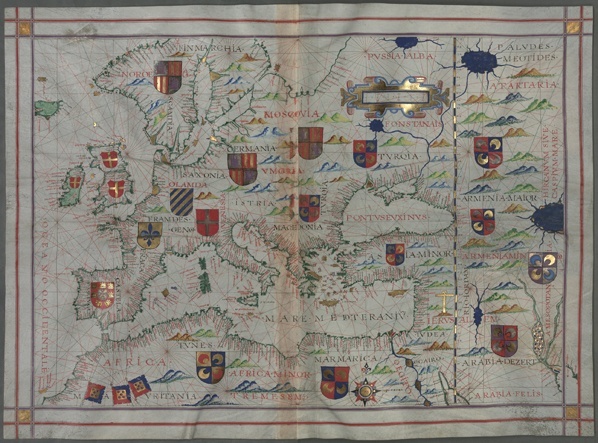 Almeida's copy is of most importance for the Portuguese cartography as it contains the cartographic picture of this map of Eastern Europe that has not been recovered until today. This statement was defended in the paper »The Portuguese Cartographer Fernão Vaz Dourado and his lost chart from 1571 depicting Eastern Europe and Asia« by Thomas Horst and João Carlos Garcia, given at the 17th International Conference of Historical Geographers on 19th July 2018 in Warsaw. 7. University Library of Munich, Nachlass Friedrich Kunstmann C 7.1. 8. Ibid., C 7.2. Compare http://purl.pt/3973. 9. The Munich copy (Nachlass Friedrich Kunstmann C 19) is not digitized yet. 11. As most of the books are written in Portuguese, it is one of the biggest collections of Iberian books of the 19th century in Germany. 12. University Library of Munich, Nachlass Friedrich Kunstmann A 18.1 & 2. 13. Unfortunately we do not have any information about the provenance of these maps. 14. Unfortunately they are not catalogued. Only a new inventory of this unique map collection, together with a comparison of the old catalogues, will provide us with the information, what is preserved now in Germany, somewhere else or lost. ALMEIDA, Sylvia Lacerda Martins de (1973): Uma filha de D. Pedro I: Dona Maria Amélia. São Paulo: Companhia Editora Nacional. BUJOK, Elke (2009): "Ethnographica in early modern Kunstkammern and their perception", Journal of the History of Collections 21/1, pp. 17-32. DIEMER, Dorothea & Paul (1995): "Das Antiquarium Herzog Albrechts V. von Bayern. Schicksale einer fürstlichen Antikensammlung der Spätrenaissance", Zeitschrift für Kunstgeschichte 58, pp. 55-104. DÖLLINGER, Ignaz von (1878): "Gedächtnisrede auf Alexandre Herculano de Carvalho", Bayerische Akademie der Wissenschaften, Philosophisch-Philologische Klasse, Sitzungsberichte 1,11, pp. 158-185. FARINHA FRANCO, Luís; RAFAEL, Gina (coord. ), (2009): Joaquim Heliodoro da Cunha Rivara, 1809-1879. Lisboa, Biblioteca Nacional. GARCIA, João Carlos et al. (coord. ), (2014): Atlas universel de Fernão Vaz Dourado, 1571. Reprodução facsimilada do atlas de Fernão Vaz Dourado, assinado e datado em Gôa, em 1571, cujo original faz parte das coleções do Arquivo Nacional da Torre do Tombo. Barcelona: M. Moleiro. GARCIA, João Carlos; MOREIRA, Luís ‚Miguel (2016): "Os mapas nas coleções da Biblioteca Pública da Braga". Revista Catalana de Geografia IV època / volum XXI / núm. 54 / octubre 2016. HARTIG, Otto (1917): Die Gründung der Münchener Hofbibliothek durch Albrecht V. und Johann Jakob Fugger vorgelegt am 7. Februar 1914 (Abhandlungen der Bayerischen Akademie der Wissenschaften, Philosophisch-Philologische und Historische Klasse, 3,2). München, Verlag der Königlichen Bayerischen Akademie der Wissenschaften. HOPPE, Brigitte (1994): "Kunstkammern der Spätrenaissance zwischen Kuriosität und Wissenschaft", in: GROTE, Andreas (coord. ): Macrocosmos in Microcosmos. Die Welt in der Stube. Zur Geschichte des Sammelns 1450 bis 1800 (Berliner Schriften zur Museumskunde 10). Opladen, Leske + Budrich, pp. 243-263. HORST, Thomas (2017): "The Relationship between Portugal and the Holy Roman Empire at the Beginning of the Early Modern Period: a Brief Introduction". Renaissance Craftsmen and Humanistic Scholars: European Circulation of Knowledge between Portugal and Germany (Passagem. Estudos em ciências culturais/Studies in Cultural Sciences/Kulturwissenschaftliche Studien 10). Frankfurt am Main, Peter Lang, pp. 9-35. HORST, Thomas; LOPES, Marília dos Santos; LEITão, Henrique (coord.) (2017): Renaissance Craftsmen and Humanistic Scholars: European Circulation of Knowledge between Portugal and Germany (Passagem. Estudos em ciências culturais/Studies in Cultural Sciences/Kulturwissenschaftliche Studien 10). Frankfurt am Main, Peter Lang. HORST, Thomas (2018a): "Die Bayerische Armeebibliothek und ihre wechselhafte Geschichte (bis 1984)". Jahrbuch für Buch- und Bibliotheksgeschichte 3, pp. 73-107. HORST, Thomas (2018b): "Zur wechselhaften Geschichte der ehemaligen Wehrkreisbücherei VII - Die Historie einer Irrfahrt". Bibliotheksforum Bayern 4/2018, pp. 265-269. HORST, Thomas (2019): "Wertvolle Cartographica aus dem Bestand Bayerische Armeebibliothek in der BSB. Rund ein Drittel ist bereits digital zugänglich". Bibliotheksforum Bayern 1/2019, pp. 28-33. HUPPERTZ, Hubert (coord.) (2001): Briefe 1821-1890 an Johann Joseph Ignaz von Döllinger (Doellingeriana II), vol. VI: Herculano-Hülskamp. Alverskirchen, Huppertz. IMPEY, Oliver; MacGREGOR, Arthur (coord.) (1985): The Origins of Museums: The Cabinet of Curiosities in Sixteenth- and Seventeenth-Century Europe. Oxford, Clarendon Press. JORDAN GSCHWEND, Annemarie (2017): "Anthonio Meyting: Artistic Agent, Cultural Intermediary and Diplomat (1538-1591)". 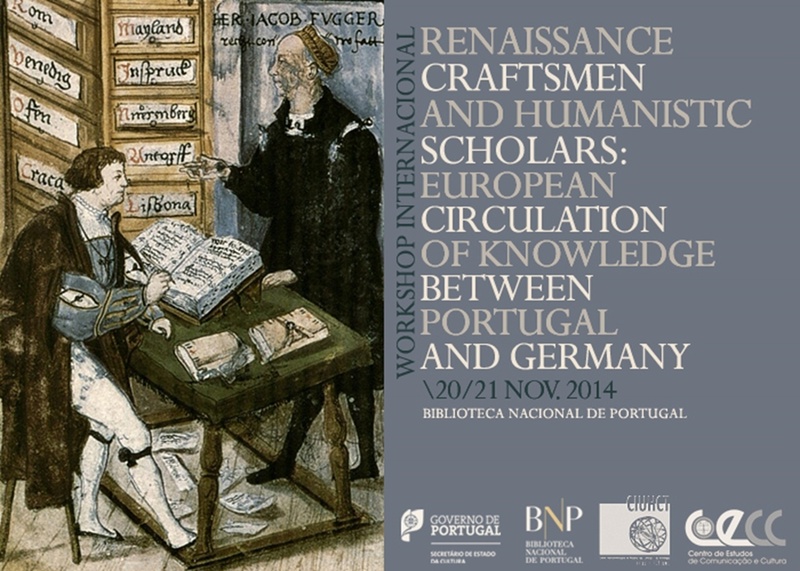 Renaissance Craftsmen and Humanistic Scholars: European Circulation of Knowledge between Portugal and Germany (Passagem. Estudos em ciências culturais/Studies in Cultural Sciences/Kulturwissenschaftliche Studien 10). Frankfurt am Main, Peter Lang, pp. 187-201. JORDAN GSCHWEND, Annemarie; Pérez de Tudela, Almudena (2003): "Exotica Habsburgica. La Casa de Austria y las colecciones exoticas en el Renacimiento temprano", in: Alfonso Mola, Marina/ Martinez Shaw, Carlos (coord. )., Oriente en Palacio. Tesoros asiaticos en las colecciones reales espanolas. Madrid: Patrimonio Nacional, pp. 27-44. JORDAN GSCHWEND, Annemarie; LOWE, Kate J.B. (coord.) (2015): The Global City: On the streets of Renaissance Lisbon. London: Paul Holberton. KNEFELKAMP, Ulrich; DOS SANTOS LOPES, Marília; HANENBERG, Peter (coord.) (1995): Portugal und Deutschland auf dem Weg nach Europa. Portugal e a Alemanha a caminho para a Europa. Pfaffenweiler, Centaurus. KRAUS, Michael (2007): Novos Mundos - Neue Welten. Portugal und das Zeitalter der Entdeckungen. Eine Ausstellung des Deutschen Historischen Museums Berlin in Zusammenarbeit mit dem Instituto Camões, Lissabon und der Botschaft von Portugal in Berlin [24. Oktober 2007 bis 10. Februar 2008]. Berlin, Deutsches Historisches Museum. KUNSTMANN, Friedrich (1844): "Die Bibliotheken Portugals und das Archiv in Lissabon". Bulletin der königlich Akademie der Wissenschaften für das Jahr 1844, No. 9-14 (März 1844), column 69-110. KUNSTMANN, Friedrich; VON SPRUNER, Karl; THOMAS, Georg Martin (coord. ), (1859): Atlas zur Entstehungsgeschichte Amerikas. Aus Handschriften der K. Hof- und Staats-Bibliothek, der K. Universitaet und des Hauptconservatoriums der K. B. Armee (Monumenta saecularia 3,2-2). München, Bayerische Akademie der Wissenschaften. KUPCIK, Ivan (2000): Münchner Portolankarten. »Kunstmann I-XIII« and Ten Further Portolan Charts. A revised and supplementary new edition of Friedrich Kunstmann's original work of 1859 with 13 rendered color plates and ten further sea charts of early 16th century from the Munich portolan charts collections including those missing since 1945. München; Berlin: Deutscher Kunstverlag. LOPES, Marília dos Santos (1992): Afrika. Eine neue Welt in deutschen Schriften des 16. und 17. Jahrhunderts. Stuttgart, Steiner. MACHADO SANTOS, Mariana Amélia (1965): Alexandre Herculano e a biblioteca da Ajuda (O Instituto 127). Coimbra. LOPES, Marília dos Santos (2016): Writing New Worlds: The Cultural Dynamics of Curiosity in Early Modern Europe. Newcastle upon Tyne/UK, Cambridge Scholars Publishing. METZIG, Gregor (2010): "Kanonen im Wunderland - Deutsche Büchsenschützen im portugiesischen Weltreich (1415-1640)". Militär und Gesellschaft in der Frühen Neuzeit 14, pp. 267-298. MEURER, Peter H. (1997): "Eine Rechnung für eine Kartenlieferung des Hauses Fugger an Alonso de Santa Cruz von 1546. Beiträge zur kartographiegeschichtlichen Quellenkunde II". Cartographica Helvetica 16, pp. 31-38. MOREIRA, Luís Miguel A. B. 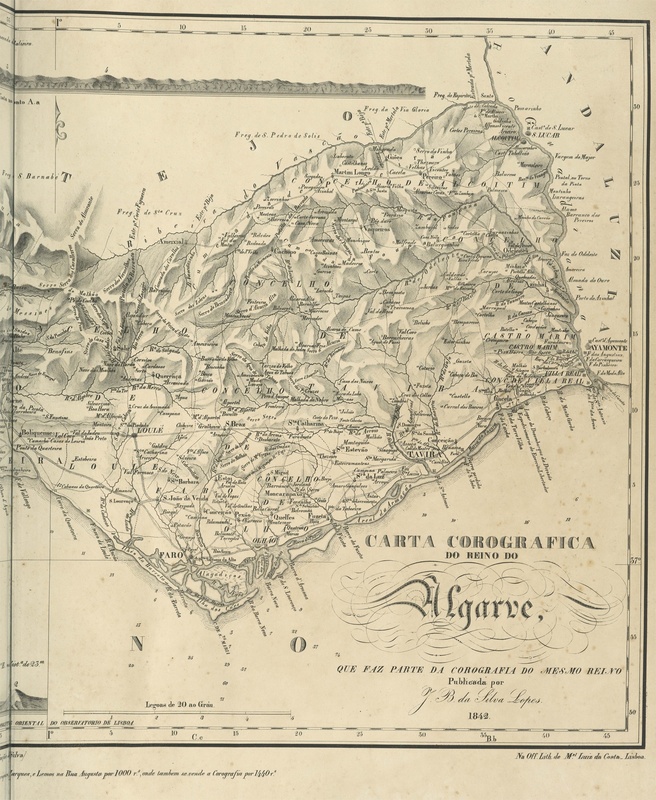 (2011): O Mapa Corografico dos Reinos de Portugal e Algarves Copiado do Inglez de W. Faden (1809): construir a imagem de um país, in: IV Simpósio LusoBrasileiro de Cartografia Histórica. Porto, 9 a 12 de Novembro de 2011, pp. 1-5. MOREIRA LIMA, Sérgio Eduardo (coord.) (2016): Varnhagen (1816-1878). Diplomacia e pensamento estratégico (história diplomática). Brasília, Fundação Alexandre de Gusmão (FUNAG). NETO, Maria João Baptista (2007): "Wilhelm Ludwig von Eschwege (1777-1855), um percurso cultural e artístico entre a Alemanha, o Brasil e Portugal", in: FERREIRA-ALVES, Natália Marinho (coord. ), Artistas e Artífices e sua Mobilidade no Mundo de Expressão Portuguesa (Colóquio Luso-Brasileiro de História da Arte 7; Porto, Viana Castelo, Barcelos, 20 a 23 de Junho de 2005). Porto: CEPESE, pp. 385-392. POHLE, Jürgen (2000): Deutschland und die überseeische Expansion Portugals im 15. und 16. Jahrhundert (Historia profana et ecclesiastica 2). Münster, LIT-Verlag. POHLE, Jürgen (2017): Os mercadores-banqueiros alemães e a Expansão Portuguesa no reinado de D. Manuel I (CHAM eBooks - Estudos 2). Lisboa, CHAM. SCHMELLER, Johann Andreas (1844): "Ueber einige ältere handschriftliche Seekarten". Bayerische Akademie der Wissenschaften, Philosophisch-Philologische Klasse, Abhandlungen 4,7, Abtheilung 1, pp. -273. SCHMIDT, Maria Junqueira (1927): Amelia de Leuchtenberg: A segunda imperatriz do Brasil. São Paulo, Companhia Melhoramento de São Paulo. SEELIG, Lorenz (2008): "Die Münchner Kunstkammer", in: SAUERLÄNDER, Willibald (coord. ), Die Münchner Kunstkammer (Bayerische Akademie der Wissenschaften, Phil.-hist. Klasse, Abhandlungen N. F. 129). München: Bayerische Akademie der Wissenschaften, vol. 3, pp. 1-124. SIEGEL, Steffen (2006): "Die »gantz accurate« Kunstkammer. Visuelle Konstruktion und Normierung eines Repräsentationstraums in der Frühen Neuzeit", in: BREDEKAMP, Horst; SCHNEIDER, Pablo (coord. ), Visuelle Argumentationen. Die Mysterien der Repräsentation und die Berechenbarkeit der Welt. München, Wilhelm Fink, pp. 157-182. SOMMER, Frederico (1952): Guilherme Luiz, Barão de Eschwege. São Paulo: Melhoramentos. TORRES, Lígia Lemos (1947): Imperatriz Dona Amélia. São Paulo, Elvino Pocai. VALTER, Claudia (2000): "Wissenschaft in Kunst- und Wunderkammern", in: HOLLÄNDER, Hans (coord. ), Erkenntnis, Erfindung, Konstruktion: Studien zur Bildgeschichte von Naturwissenschaften und Technik vom 16. bis zum 19. Jahrhundert. Berlin, Mann 2000, pp. 183-196.